Japan loves its pancakes, judging by the wide variety of pancake restaurants and desserts menus with this option. I’ve eaten Hot cakes in old Cafés, traditional american pancakes, different flavor pancakes, pancakes with fruits and whipped cream, as well as some with eggs and bacon and last but not least the popular, big and fluffy soufflé pancakes that melt in your mouth. So it might be not surprising, that I always jump at the chance to try a new variety. 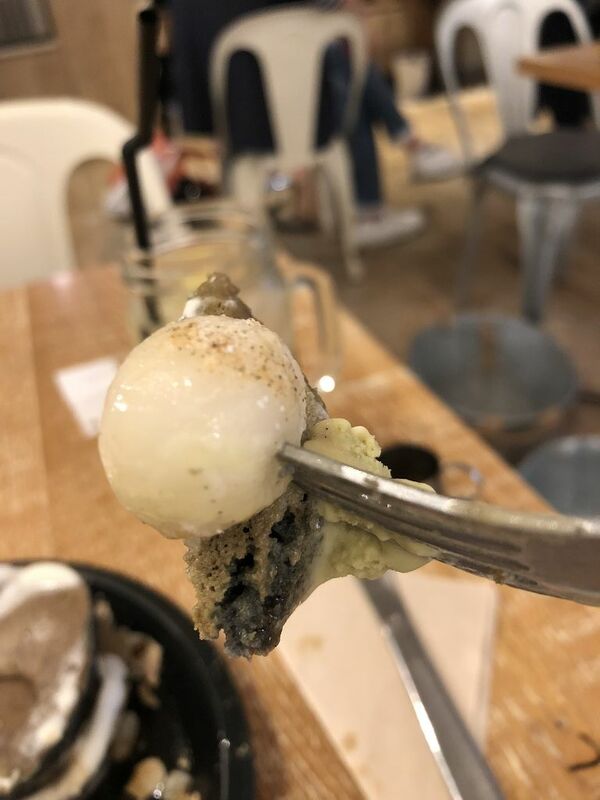 Right now J’S PANCAKE CAFÉ offers japanese sweets inspired pancake and crêpe (from May 22nd to June 17th) and the pictures looked too intriguing to not try at least one of them. 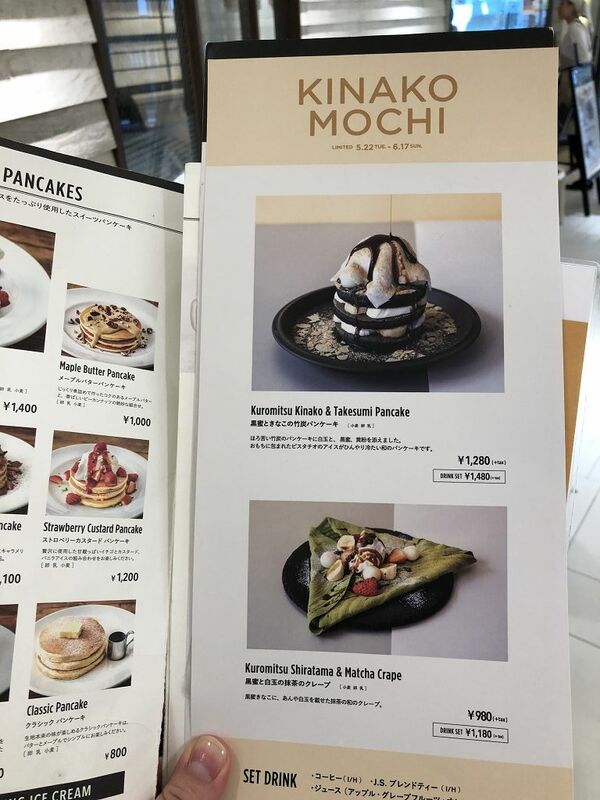 On offer are the Kuromitsu Kinako & Takesumi Pancake and the Kuromitsu Shiratama & Matcha Crape (yes, that is how they spell crêpe). Lucky for me there weren’t too many people waiting, so it took only about 15 minutes to be seated. I think I have written about it before, but waiting up to an hour to get into a restaurant is normal for me here in Japan, though it is something I would have never done in Germany. Partly because you wouldn’t find lunch or dinner crowds lined up there like they do here. Another by the way for you: It was very quiet here on my blog for a long time and this was due to me being pregnant and now having a little one of about seven months. Which certainly influences how and where I eat and which restaurants I choose. But back to the pancakes. My order was already taken while waiting in line, so I didn’t have to wait long after being seated (yay for that, since I often forget to eat something until I’m hangry). 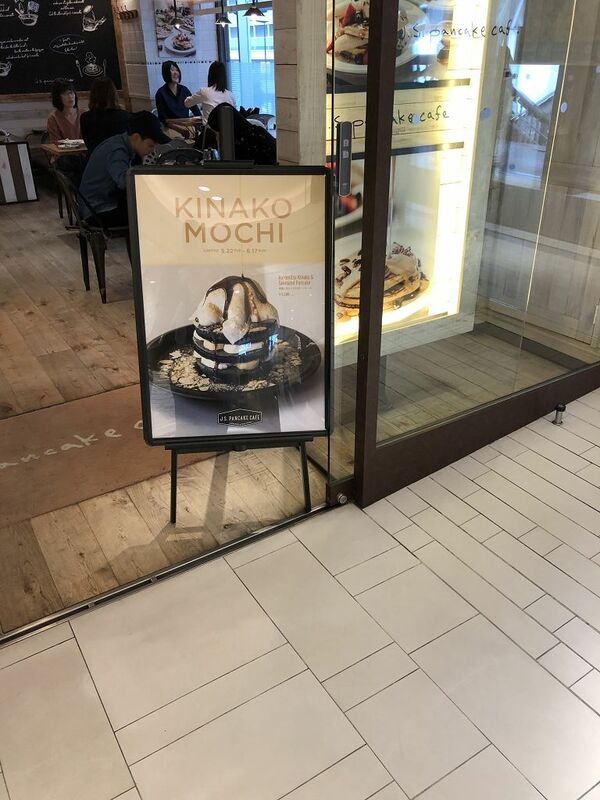 I decided upon the Kuromitsu Kinako & Takesumi Pancake with its winning combination of pancake, mochi and pistachio ice cream, though I was skeptical about the taste of the takesumi – 竹炭 (bamboo charcoal). By the way, don’t you just love how food in Japan always looks like the pictures or wax samples (which are awesome in themselves)? Looking good! Here combined with a Honey Lemon Honey Lemonade from the Drink Set Menu. 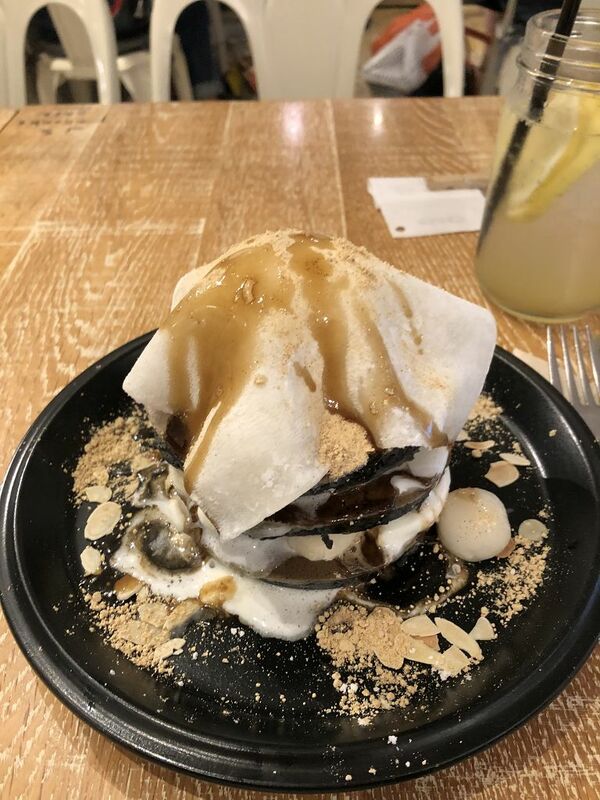 The Takesumi pancakes are stacked with banana, shirotama – 白玉 (mochi balls) and whipped cream, while under the mochi layer on top sits the pistachio ice cream, topped of with Kinako and almond slices. The Kuromitsu is brought separately in a tiny jug, so you can enjoy pouring it over your pancakes. And then it was time for the taste test. The combination of kinako – きな粉 (roasted soybean flour) and kuromitsu – 黒蜜 (sugar syrup) reminds immeditaley of japanese sweets, enhanced by the chewiness of the mochi. The bamboo charcoal pancakes were less sweet and had a slightly nutty taste, especially with the kinako on top. The ice cream gave it the extra kick, so all in all I was quite impressed with these pancakes and enjoyed them very much. I love the ever changing flavours, limited editions and new combinations of food here in Japan, though I inevitably tend to like those limited items that are only available for a short time and never make a comeback. Oh man I love kinako!